17 Years ago a friend and I had gone on a cycling / camping trip to the Yorkshire Dales. 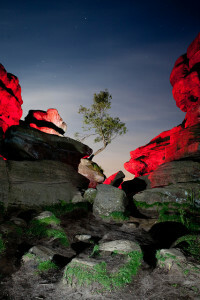 Camping near Brimham Rocks on Saturday night we were curious to hear a distant thumping sound of rave music in this rural location at 2am. As we had out mountain bikes with us we felt sure we could follow the sound to its source so after cycling for around 6 miles in the direction of the steadily increasing volume we were amazed to come across hundreds of people at a large outdoor rave in a forest on the banks of Fewston Reservoir. It turned out it was the LS8 sound system from Leeds and I knew quite a few of the folks there who were organising and attending the party. Many of the ravers thought we’d cycled the 20+ miles from Leeds to get to the party and they were amazed to hear we didnt even know about the rave until we heard the music from up the valley where we were already on a camping holiday. The party continued until Sunday afternoon when people started to drift away and we decided to return to our tents and have a bit of a nap before continuing on our trip. I’ve driven all over the UK to various free party soundsystem raves – DIY Sound System / Smokescreen etc but this was the first time I’d cycled to one.